The Pixel Dragon came from another dimension through a cable, but a glitch happened, so he landed here in low quality! This made him feel ashamed in the beginning, but now he\'s happy because pixels are what make him unique. Pixel is not Currently Breedable. Sorry. Pixel is a Legend primary element dragon and so can only be critical hit by other Legends. Avoid using Physical based attacks against Pixel as they will have a weak effect. 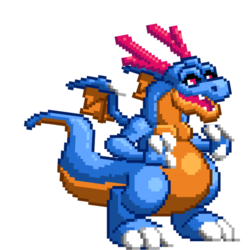 To beat Pixel use high category dragons with strong attacks, higher level, and/or lots of stars!